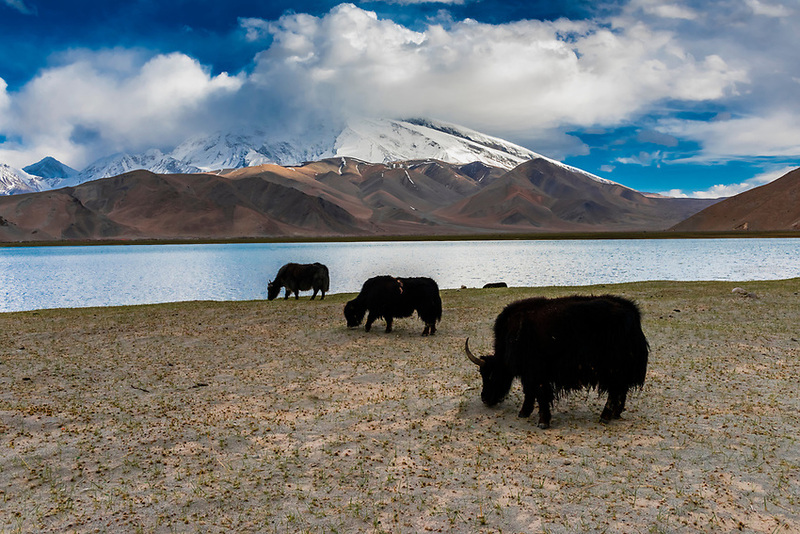 Yaks grazing along Lake Karakul (11,811 feet) is the highest lake of the Pamir plateau, near the junction of the Pamir, Tian Shan and Kunlun mountain ranges. Surrounded by mountains which remain snow-covered throughout the year, the three highest peaks visible from the lake are Muztagh Ata (24,757 ft.) Kongur Tagh (25,025 ft.) and Kongur Tiube (24,704 ft.).The Karakoram Highway passing through the Pamir Mountains in Xinjiang China. It is the highest paved international road in the world; it connects Western China and Pakistan. It is one of the very few routes that cross the Himalayas and the most westerly of them. Historically, this was a caravan trail, one branch of the ancient Silk Road.